Mohawks head coach Josh Keeney celebrates with senior Hunter Berry during pregame introductions. Junior Harald Rundquist reacts after being called for a foul. Rundquist would score three goals in the game. Northwest players celebrate following their 7-1 win over Waverly. With the victory, the Mohawks clinched their first outright SOC title since 1993. 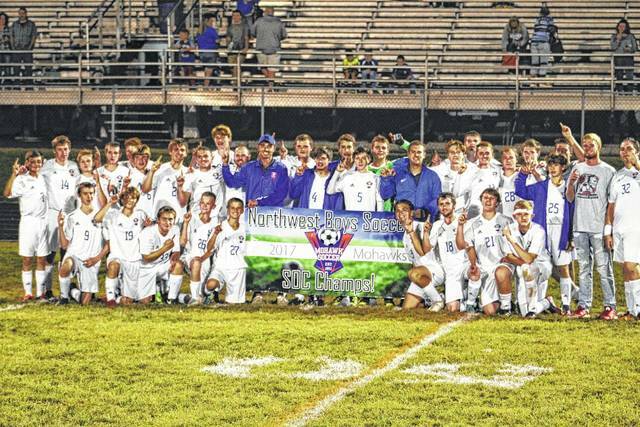 It was a special night for soccer at Northwest High School on Thursday. 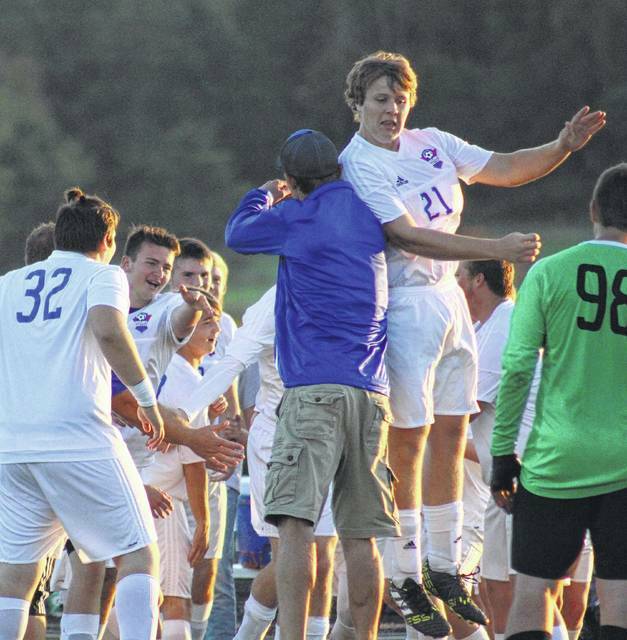 For the first time since 1993, the Northwest Mohawks boys soccer team had a chance to win an outright SOC soccer title. 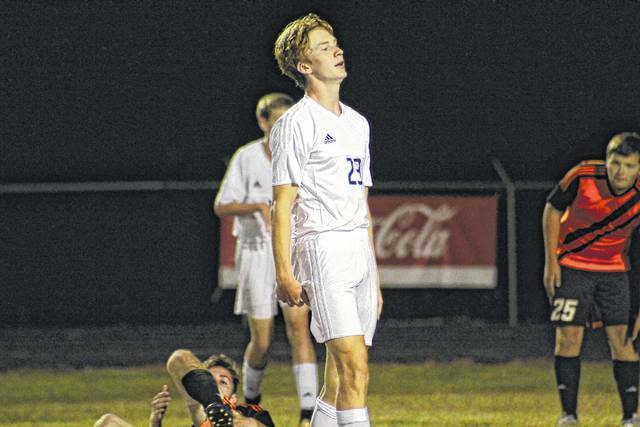 In what become a night to remember for the Northwest soccer community, the Mohawks were able to defeat the Tigers 7-1 while improving their record to 12-0 on the season. Fans packed the stands, decked out in red and blue. The Northwest marching band performed throughout both the boy’s and girl’s games, and a student section formed to cheer on the Mohawks. The anticipation was building all throughout the evening. Fans eagerly awaited to see if this Northwest team could remain unbeaten, and the Mohawks faithful got quite a performance from their team. The fans, players and even the coaches all knew what was at stake. The team broke their huddle to start the game with a “one, two, three – SOC!” chant. Later in the game, the student section began yelling “SOC, SOC, SOC” in unison. It was clear how much this game meant to the school and community. Northwest head coach Josh Keeney was almost speechless after the game, overwhelmed with the excitement of the win. On the field, Waverly was able to stay in the game for the first part of the half. The crowd nearly erupted when junior Evan Throckmorton narrowly missed two shots at the 28 minute mark. His first attempt sailed high, and his second shot went a bit wide. Throckmorton would make up for those misfires shortly, though. But first, it was senior Tyler Webb who put Northwest on the board. His shot found the left corner of the goal at the 27:18 mark, and put Northwest in front 1-0. Webb kept the offense flowing when he found Rundquist for his first score of the night with 20:21 left in the first half. Rundquist’s goal extended the lead to 2-0. With 7:06 to play before halftime, Throckmorton got Northwest another goal from a penalty kick after Webb was taken down in the box. Throckmorton used a nice head fake to bait the goalkeeper, then nailed the shot into the right corner for the score. Northwest led at the half, 3-0. Waverly was still very much in the game early in the second half. The Tigers had an opportunity to cut the deficit two minutes into the period, but senior Elijah Lummer’s shot missed to the left. With the Tigers unable to capitalize, the Mohawks looked to add to their lead. At 23:41 in the second half, Rundquist scored his second goal on a shot that just snuck by the Waverly keeper. With that, Northwest was now ahead 4-0. The Tigers needed an answer. It looked as though they might get one, but sophomore Grayson Diener just missed off to the right at the 22 minute mark. Rundquist would make the most out of the Waverly miss, as he scored once again at the 21:13 point of the second half. It was Rundquist’s third goal of the game, and Northwest was now on top 5-0. The Mohawks would add a couple more scores before it was all said and done. Senior Mason Campbell scored on the 15:26 mark on a nice individual play. His initial shot was deflected by Waverly’s keeper, but it deflected right back to Campbell who had a free shot at the net. Campbell made the most of it, and Northwest stretched the lead to 6-0. Just under two minutes later, the Mohawks got their final score of the evening when senior Austin Slusher hit a beautiful shot that fell softly into the back right corner over the keeper’s head. Northwest then increased their lead to 7-0 on the Slusher score. Waverly got a goal from senior PJ Howard with 4:50 to play to close the scoring out at 7-1 in favor of the Mohawks. Once the clock hit zero, it was time to celebrate. Students stormed the field, and the soccer players ran over to celebrate the victory with their peers. The band played the fight song, and the Mohawks enjoyed their place in history. Rundquist, who is a foreign exchange student from Sweden, agreed with his coach. “I never expected this when I came here, so it’s an unbelievable feeling,” Rundquist said. The team took a group picture on the field with a banner that read “SOC Champs,” and the team enjoyed what was a night to remember in McDermott. While the win was monumental for the program, Keeney and his players are hoping the success doesn’t stop there. For Rundquist, the goal is simple moving forward. He just says he wants Northwest to “win everything we can” the rest of the season. Northwest will make the trip to Wheelersburg next Tuesday (Oct. 3) to take on the Pirates. The Mohawks also host Adena on Thursday (Oct. 5). Waverly will also challenge the Pirates next Thursday, and will play at McClain next Saturday (Oct. 7).